Question 1: Does my rig qualify as "self-contained"? A self-contained RV is one that is set up to allow all functions of living (sleeping, eating, cooking, and sanitation) to be handled completely while inside the RV. A toilet system, including a holding tank is an absolute requirement. Confirmation that you'll be traveling in a self-contained RV is required to purchase or activate guest privileges. This requirement is in place to honor our promise to hosts that they'll only get requests from travelers who are prepared to be totally self-sufficient and, if necessary, as inconspicuous as possible. Question 2: My trailer doesn't have a bathroom, is my marine style / casette portable toilet sufficient? Yes, but only if you are willing to use it inside your rig and dispose of the waste after leaving the host property. DO NOT ask a host if you can dispose of your waste unless they explicitly indicate on their profile that they offer an RV dump location. Question 3: Can I set up a tent for my portable toilet? As a general rule, expect the answer to be NO. Many hosts will not want tents on the property for safety, sanitary and appearance purproses. If a host is in a rural area and it seems like it might be okay, then you may ask the host, but always plan in advance to do your business in your rig. Question 4: Does any vehicle with a portable toilet qualify? No. Ony if your vehicle is an actual RV (motorhome, trailer or truck camper). If it was not manufatured as one, we MAY allow it, but you MUST contact us before joining. We'll determine eligibility based on other factors as well. Use the "Contact Us" link to send us a full description and be prepared to send us photos of your interior set up if we request them. Question 5: Can I be a guest in my popup or hybrid trailer? As long as the toilet issue as outlined in question #2 and #3 has been sorted, then you may join as a guest member. However, be prepared that some hosts may decline your request because of their proximity to neighbours - an open tent trailer is much less stealthy than a hard-sided one or a motorhome. Upon joining you will be prompted to complete a profile which includes the style of your rig, please answer honestly so that hosts know what to expect upon receiving your request to stay with them. Question 6: Does my homemade or custom built RV qualify for guest privileges? Yes. But, if a custom-built unit is not easily recognizable as an RV (a regular van, windowless cube van, or utility trailer are examples), we highly recommend you add a detailed description of your RV interior on your guest profile to ensure the best chance of success with hosts. If you have a portable toilet (composting or other), describe that set up, too. Potential hosts want to know how your rig meets our requirement as a self-contained RV. Hosts receive a link to your guest profile with your stay request. They'll view that and see a photo of your rig before deciding to accept or decline. Although you may qualify for membership, in the end, it's up to each host what type or RV they will accept. Question 7: Can I be a guest in my mini-van? We've seen some lovely van conversions, so we know that a van can certainly qualify as an RV. However a matress in the back of a mini-van is not sufficient for membership. Our hosts have not signed up with the intention of hosting people living out of the back of their vehicles. 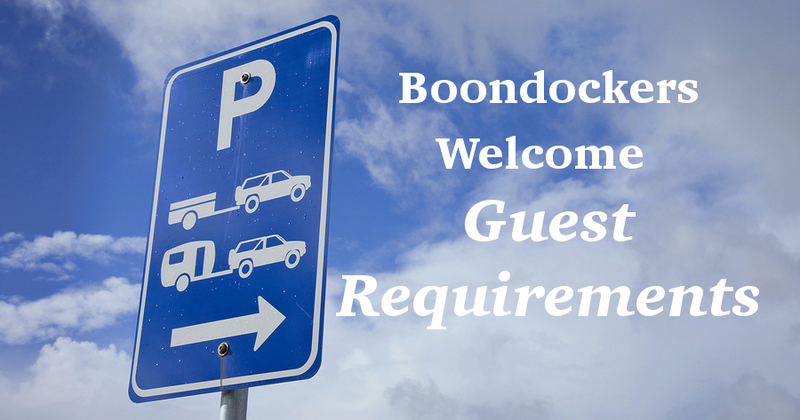 Question 8: Can I tent-camp with Boondockers Welcome hosts? No. Even if some hosts are in campground-like settings, this is not the platform to search for tent camping. Question 9: Can I use a Boondockers Welcome guest subscription to book longer-term stays with a host while working in the area? Our hosts are expecting requests from guests for a night or two while travelling through an area. Although some hosts don't mind providing parking for the first night you arrive in their area and perhaps recommending a campground you can move to, others may turn down your request. If you are seeking accommodation while in the area to earn a living, please look for another alternative than our hosts. Question 10: What should a host do if they get a request from a member who doesn't appear to qualify? Pease report them to us and refuse their request or delay accepting it until you hear back. Even if you're willing to accommodate them, other hosts may not be, so reporting them is a courtesy to your fellow hosts. Guests must confirm they meet the requirements before they can activate privileges, but we'll revoke these privileges if necessary. The answers to these and many more questions can be found on our Frequently Asked Question page. Or if you have questions that haven't been answered here, you can always send us a note and we'll get back to you as soon as possible!